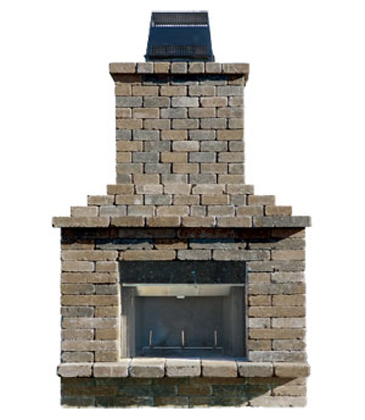 Camrbridge Olde English Paver Fireplace Kit – Designed with small individual paver units, the Cambridge Pre-Packaged Olde English Paver Fireplace Kit has all the characteristics of a traditional brick fireplace. This fireplace is truly elegant and is pre-packaged complete with three pallets of Olde English Pavers, five concrete lintels and a top of the line Lennox stainless steel fireplace. It features stainless steel curtain pull screens, a stainless steel fire grate, a 4-foot high, air-cooled chimney and black powder coated termination cap complete with galvanized flashing. Also standard are refractory brick panels inside the firebox and five 6&apos; x 6&apos; polished granite tiles for the face on the front of the unit. Shipped as a wood burning unit, the fireplace can also be converted to gas. See instructions. Only minimal cutting of approximately 23 pcs. of Olde English Pavers is required. Step-by-Step instructions are included. Optional wood box also available.